Gutzler Fire, view from I-70 near Eagle. EAGLE — Where there’s fire, there’s smoke and regional wildfires are generating enough smoke that state health officials issued an air-quality advisory. 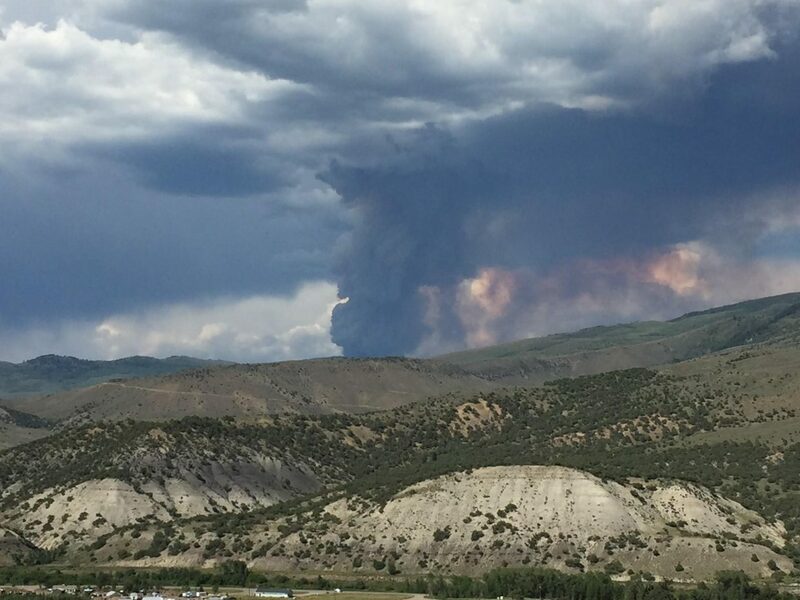 The Gutzler fire grew overnight Monday to more than 850 acres in remote northern Eagle County. When the wind shifted Tuesday afternoon, the smoke began blowing into the Interstate 70 corridor and the Vail Valley. That prompted the Colorado Department of Public Health and Environment to issue an air-quality health advisory due to wildfire smoke in Eagle, Summit, Lake and southern portions of Grand counties. A small fire north of Rifle is 100 percent contained, but another fire broke out in Summit County on Wednesday near Breckenridge. Rebecca Larson, an epidemiologist with Eagle County, is recommending that if smoke becomes thick in your neighborhood, you might want to stay indoors. “This is especially true for those with heart disease, respiratory illnesses including asthma, the very young and the elderly,” Larson said. Larson said right now the smoke is moderate. When your visibility is less than five miles, it’s getting severe. “That’s an unhealthy level for everyone. Right now, we’re still at the moderate phase,” Larson said. Wednesday’s warning is for small children, the elderly and people with respiratory and lung problems. If you fall into those categories, then you’ll do well to avoid heavy activity outdoors, Larson said. Wearing one of those dust masks you buy in the hardware store won’t help. They trap things like sawdust, not particulates in smoke. The Gutzler fire made a 550-acre run Tuesday afternoon and evening, growing to 850 acres total overnight, said Aaron Mayville, with the U.S. Forest Service’s Holy Cross Ranger District, in a statement. However, firefighters are getting it surrounded. On Tuesday, crews built a suppression line along the southwestern side of the fire and are connecting that line to natural barriers when possible, Mayville said. The fire is burning dead and downed beetle-kill timber along a mesa. The line firefighters are building is joined by an irrigated field. Beyond that field is a ranch and some of the only structures in the area. Firefighters will use both indirect and direct suppression tactics as they contain the fire, Mayville said. The Forest Service is partnering with Eagle County for communication.